Transcription of Bennet's book "New Experiments". 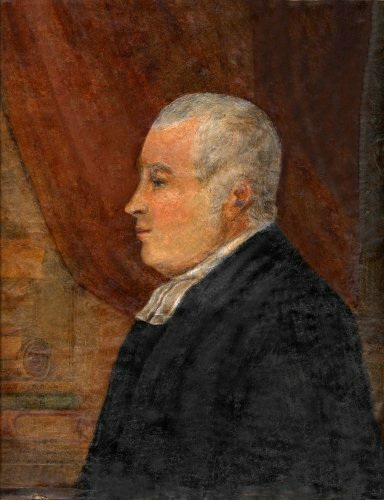 A portrait of Abraham Bennet hangs in the vestry of Wirksworth Church which is half-length, done in oils and about 10.5 by 9 inches in size. The picture, though in need of a clean, clearly shows a profiled figure in clerical dress with grey hair, a large forehead and a straight, aquiline nose. It can be dated to between 1789 and 1799 because Bennet is shown holding a copy of his New Experiments with another book and a roll of parchment, probably representing his scientific papers. In addition to his own speculations, Bennet's notebook contains extracts from books, periodicals and newspapers demonstrating the thought processes of a man of the 18th century "well versed in different branches of natural philosophy". Bennet died in 1799 after a "severe illness" and was buried on 9 May.